Mexico is home to a lot of stunning and majestic tourist destinations. In line with this is the marriage culture of the country which plays a vital role in choosing your Acapulco woman for life. It is the best place to find your very own Mexican bride. Los padrinos y madrinas (wedding sponsors). They are considered as the godparents. One of the most important roles of godparents is to have responsibilities of paying for a certain aspect in the wedding celebration, so as the finances of some wedding rituals. The padrinos and madrinas may also be assigned for a specific duty during the wedding ceremony like wrapping the wedding lasso around the couple or carrying the las arras (golden coins). Others may walk down the aisle with the couple’s parents or be the host of bridal shower. It depends on the agreement. Las arras matrimoniales (wedding coins). Marriage in Mexico basically involves a set of thirteen gold coins presented by the groom to the bride as a symbol of his trust. The number 13 itself symbolizes Jesus and his 12 apostles. Those gold coins also signify the groom’s financial treasures. By heartily giving it to the bride, it shows that the groom entrusts his wealth to his future wife too. El lazo (wedding lasso). Technically, it is a string of flowers and rosary beads which is placed or wrapped around the shoulders of the couple. It must be forming eight (8), like an infinity symbol. It is done after the couple proclaim their wedding vows. Wedding in Mexico also includes el lazo to symbolize eternal love and unity of the couple. It will only be removed by the priest. La Tornaboda (wedding after-party). It refers to a small gathering of close family and friends of the couple which happens after the bigger party at the reception; that’s why it’s called after-party. This celebration is made to allow the newly-wedded couple to at least have a more intimate commemoration of the people close to their hearts since the celebration at the reception is more likely a bigger fiesta. Mexican money dance. Lastly, the money dance must be taken so as to symbolize the significance of wishing the couple good luck throughout the years of being together. The guests at the reception will take out bills from their wallet and pin it on the couple’s wedding clothes in exchange of a dance. Mexican women are not just good in maintaining their curvy figures; they also have amazing traits that draw men closer. Acapulco women seeking marriage always make time for the man they love. No matter how busy they could get, they can always attend to you whenever you need them. That’s how they show how important you are to them. These attributes are typically what men desire to get and live with. They really are undoubtedly beautiful inside and out---many can attest to it. They will try to steal your heart and make it pop out in your eyes in an instant. You will be mesmerized by the way they show how much you mean to them. They are fond of hugging the man they love with a conveyed message of ‘nothing can come between us’. They may not say sweet and romantic things often, but their actions will say it all. Additionally, they can cook really well too and they prefer freshly cooked or home-made dishes which you will definitely love. Their authentic sense of humor will capture your heart too. They are effortlessly funny every time. You won’t get bored being with them. In this note, your almost jaded life will be back to the limelight. Not just that, they can do laundry and domestic chores also. They may be jealous but they love intensely with all their hearts. Nobody would want to date a woman with least buoyancy in life. Mexicans are in total package--- from their good looking facade to attributes that bring challenge in you. They have what it takes to be your wife. So, why not try dating Mexicans now and be pleased? 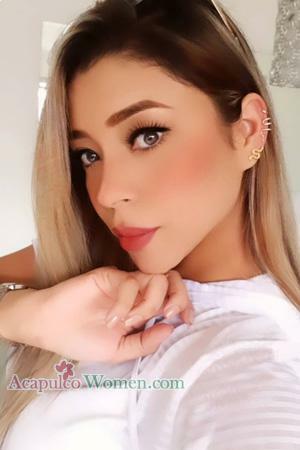 You can get in touch with them when you register now and try visiting best Acapulco matchmakers too to meet the love of your life. Choose your best partner for life!